The J P. Eliopulos Hellenic Center was built in 2007 to provide the members of the adjoining church with a place to meet. To accommodate the costs associated with building they decided to make it into an exquisite event venue for weddings, quinceneres, and business events. What makes them stand out is their excellence in service, amazing cuisine, and unsurpassed service. The Hellenic Center quickly became the top rated event venue in the Antelope Valley. Despite the venues obvious charm, its website failed to reflect it. They felt their previous site was stale and wanted something modern, user friendly, and beautiful. They also wanted something that would increase organic leads and conversions. The venue gets the vast majority of its new clients from Google search. The majority of those leads were using mobile devices and were usually women looking for venues for the weddings and quinceneres. Although the center has a large client base for business events, those clients usually come from word of mouth and repeat business. Because the website would be used most by young women, we felt a robust social media sharing function should be introduced. This would allow potential clients to share the center as a possible venue with their friends or other event organizers. The Hellenic Center let us know that they chose us because we had good ideas. So we really wanted to try something original that we'd never tried before. We looked at a wide variety of different event venue websites for inspiration. We really liked the bold borders and well made video used on Silver Fleets website, the bold colors and simplicity of 86 Cannon, and the crispness and cleanliness of Aynhoe Park. A common issue we found with event websites was that they were overloaded with large images that slowed the website down, they were often difficult to navigate, and their pursuit of modernity made them difficult to navigate. For a website like the one we needed to make, it needed lots of images to give a good idea of the interior design and lots of ideas for potential clients. However if most people were browsing on mobile phones and using their data we needed to keep the size of the site a low as possible. As a rule you should always make your website as light as possible. We decided to use different sized images for the mobile and desktop versions so we could serve smaller images to mobile. We installed a fallback image for the home page video so the video wouldn't be served when people were using their mobile data. The Hellenic Center needs to establish itself as a forward facing company with a clean and modern design. Many modern design aesthetics can be confusing and difficult to navigate for an older audience. We wanted the website to be immediatly accessible to everyone. Other than these modern features, the website mostly behaves and is used like any classic scrolling website. We produced two initial homepage designs for the clients to choose from. After they selected the first design, we designed some inside pages along the same lines. This included a text page template which could be used in the future for any other pages they might need to create. We also designed the menu pages and preferred vendors page. We used an ornamental Victorian design. Designing the logo with the site gave us more creative control. We used a custom coded border with dimpled corners that stretch to fit any section. Each preferred vendor section has its own special icon heading with victorian flair. Subtle social buttons that scroll with the page encourage sharing without compromising the look. Mobile header keeps whats important and adds a call button for easy contact. We saved time for people using mobile devices with quick jump sections. For us, the most powerful part of having an event at the Hellenic Center is when you first walk in and see everything set up. We wanted to capture that feeling for when someone first visits the website. We spent two days, before two events, filming the welcome page introduction. The video starts with two gloved hands opening the double doors and the camera swooping into the ballroom. 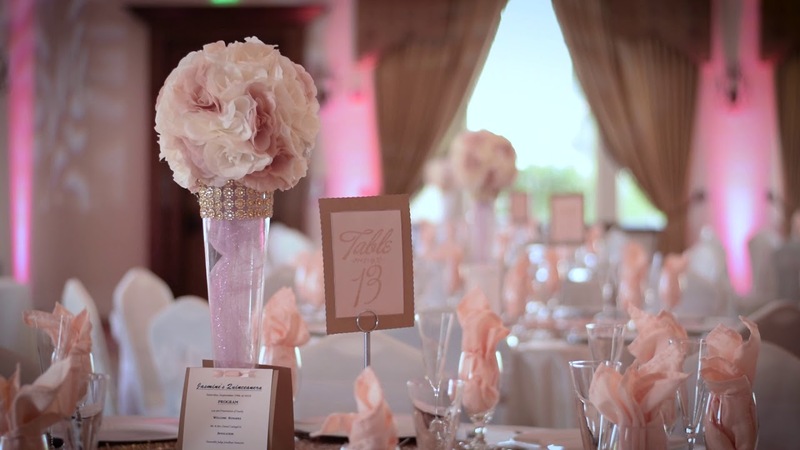 We used a drone to film the ballrooms luxurious chandeliers and a combination of depth of field shots and wide angles to tie it all together. Like many of our clients, the Hellenic Center doesn't have the time to continue to update their new website. Luckily there is an opportunity to keep the website updated and new - the audio and video vendors that work with the center regularly. Many of the clients who choose to hold their events at the Hellenic Center hire photographers or videographers to capture special moments. 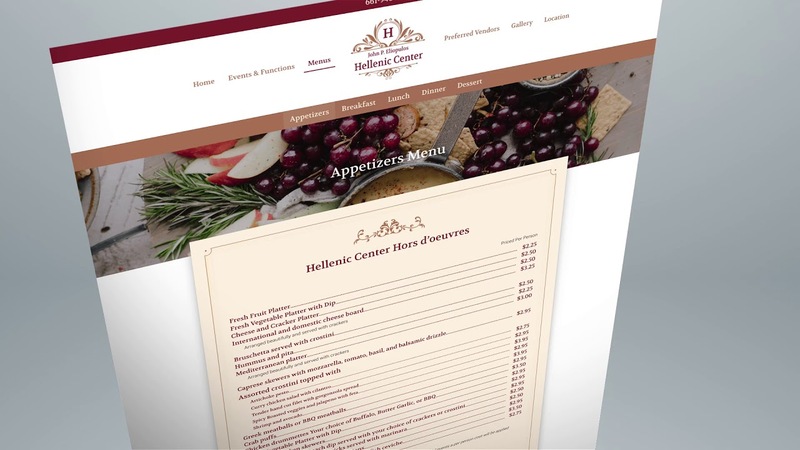 The Hellenic Center could create a stream of content by incentivizing those vendors to share their work with the website. Sharing their work would be great exposure, provide excellent SEO linking to their own websites, and act as advertising for people looking to hire vendors through the Hellenic Centers website. Jolly Good Media will be taking care of the maintenance, security and hosting of the website moving forwards. Use your mouse to scroll between the before and after of the homepage design.